We live in an interconnected world. But sadly, connecting a Mac to a Windows-based network isn’t always as straightforward as it should be. Problem: You want to run Windows apps on your Mac, but you don’t want to run Windows on it. Solution: Remotely control a Windows PC from your Mac. If you need to run Windows programs, you could use something like Boot Camp or Parallels Desktop to actually run a copy of Windows on your Mac (see Running Windows on Your Mac”). But there’s an alternative: you can remotely control a Windows PC from your Mac over a local network or the Internet. This allows you to see the Windows interface, run Windows apps, and create documents on the remote PC, all from the comfort of your familiar OS X desktop. You can even save files to either your Mac or the remote PC, and copy and paste between Mac and Windows apps. If you’re willing to spend some money, Netopia’s Timbuktu Pro ( ) is the most complete application for remotely controlling a Windows PC from a Mac. It allows you to control several different versions of Windows and control your Mac from a Windows PC. Timbuktu Pro also includes a number of handy collaborative features such as messaging, file sharing, and Voice over IP. The basic package costs $200 for a bundle containing both Mac and Windows versions. A free option, Microsoft’s Remote Desktop Connection lets you control a PC from your Mac. However, it works only with Windows XP Professional or a Windows server. The XP Pro machine must have Remote Desktop Services turned on; the Windows server needs to have Terminal Services configured. And Remote Desktop Connection doesn’t let you control your Mac from the Windows PC: it’s a one-way street. Another option would be to set up a Virtual Network Computing (VNC) server on the Windows PC and a VNC client on your Mac. Chicken of the VNC (sourceforge.net/projects/cotvnc/) is one of the most popular clients for Mac OS X. But be warned: VNC is not as easy to set up and use as Timbuktu Pro. Finally, you might consider Web-based remote control. Citrix’s GoToMyPC, a subscription service that costs $20 a month, lets you access and control a Windows PC from a Mac (but not vice versa) when you’re on any computer, anywhere on the Internet. Problem: You want to log in to your office network remotely from a Mac through a Windows-based VPN (Virtual Private Network). Solution: Find the right VPN client. VPNs let you access a remote network securely across the Internet. Many VPN services are designed primarily for Windows users, but, fortunately, your Mac has a built-in client that works with many of these Windows-friendly VPNs. To set up the client, you’ll first need to ask your network administrator for the name of the VPN server, a user name, and any other details you’ll need to log in. You’ll also have to find out whether your VPN uses PPTP or L2TP Over IPSec. With that information in hand, open Internet Connect (in the Applications folder) and choose File: New VPN Connection. Click on either PPTP or L2TP Over IPSec (whichever one your network uses) and then click on Continue. In the Configuration pop-up menu, choose Edit Configurations, and then enter the information the network administrator gave you. Unfortunately, OS X’s built-in client doesn’t work with all VPNs. If you run into problems, the next step is to download a Mac client from the company that makes your VPN’s hardware. For instance, the popular Cisco VPN Client for Mac is free to Cisco customers. If your VPN doesn’t have a Mac client, or if you need to access many different VPN systems, you can try a third-party universal VPN client such as VPN Tracker, from Equinux ($90). Note that new versions of OS X frequently break VPN client software. Before you upgrade to Leopard (Mac OS X 10.5) later this year or early next year, you’ll want to check the Web for reports about your VPN client. Problem: You want to view a Web site that’s designed for a Windows browser. Though the Web is supposed to be platform-agnostic, some sites work better in Windows than on the Mac. You may still run into the occasional page that doesn’t work quite right. Maybe it doesn’t display properly or has a pop-up movie that won’t play. Whatever the problem, you have a couple of options. First, try a different browser. Internet Explorer is a good place to start—as long as you already have a copy installed; Microsoft no longer offers it as a download. (You can still, however, find it elsewhere online.) You can also try Mozilla’s Firefox and Camino. 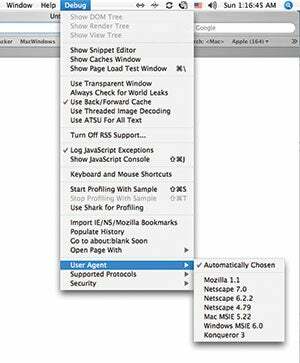 Browser Spoofing The User Agent option in Safari’s Debug menu can disguise your Mac status from Windows-oriented Web sites. at the prompt. When you relaunch Safari, open the new Debug menu and select User Agent, which will display a list of browsers. Choose Windows MSIE 6.0. That may trick Windows-friendly sites into thinking you’re one of Them. Some businesses have internal Web pages that download Windows apps to your browser. If you work at such an organization, no Mac browser will work. You need to run Windows on your Mac, and then fire up IE for Windows. Problem: You want to connect your Mac to a Windows network that uses Microsoft Active Directory. Solution: Help your IT people. Big Windows networks often use Microsoft Active Directory (AD) to manage user accounts and provide security, among other things. AD enables administrators to put users’ home folders on a server, rather than on their local machines, and can give users access to all of a network’s resources through a single log-on. With each new version of OS X, Apple has improved the Mac’s compatibility with AD. But it’s still one of the thorniest cross-platform issues. Getting connected to AD is definitely not a do-it-yourself project; you’ll need to get your network administrator involved. But you can’t leave it up solely to your admin; he or she may not even know it’s possible to add a Mac to AD. Here’s how you can help.  Apple has an article that tells you how to use the Directory Access utility to use AD home directories.  If your network also includes some Linux machines, Big Nerd Ranch has an article called Mac OS/Linux/Windows Single Sign-On that could help.  ADmitMac, from Thursby Software, installs on OS X and doesn’t require changes to any server. It enables the Mac to connect securely to the AD domain and avoids the SMB file-sharing problems that can plague OS X-AD connections.  Centrify’s DirectControl is aimed at system administrators who want to integrate not only Mac OS, but also Linux and Unix, into AD. DirectControl includes software that installs on client machines, as well as administration tools that run on Windows PCs. Finally, if you use OS X’s built-in SMB client to access some Windows volumes on a network, Mac OS may inadvertently leave behind some files that are invisible to you but quite visible—and potentially irritating—to your Windows-using network neighbors. To avoid this problem, try using ZeroOne Twenty’s BlueHarvest.